The Global Volcanism Program has no activity reports for Alney-Chashakondzha. The Global Volcanism Program has no Weekly Reports available for Alney-Chashakondzha. The Global Volcanism Program has no Bulletin Reports available for Alney-Chashakondzha. 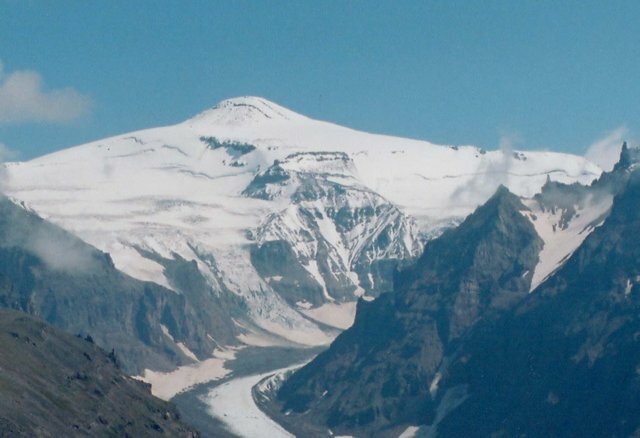 The glacier-capped Alney-Chashakondzha complex, one of the largest volcanoes of the Sredinny Range, consists of two large mostly Pleistocene andesitic stratovolcanoes constructed on a large Pliocene shield volcano. Both Alney on the north and Chashakondzha on the south are capped with andesitic lava domes. Three rhyodacitic-to-rhyolitic lava domes and associated lava flows were emplaced along ring faults enclosing a 15 x 20 km area. Two cinder cones on the east flanks of Alney and Chashakondzha erupted about 2600 years ago and produced lava flows, one of which traveled as far as 9 km. Alney is one of the few large stratovolcanoes in the Sredinny Range known to have been active throughout the Holocene, with more than 30 documented pyroclastic deposits. The last intense eruption took place about 350 years ago. Kozhemyaka N N, 1996. 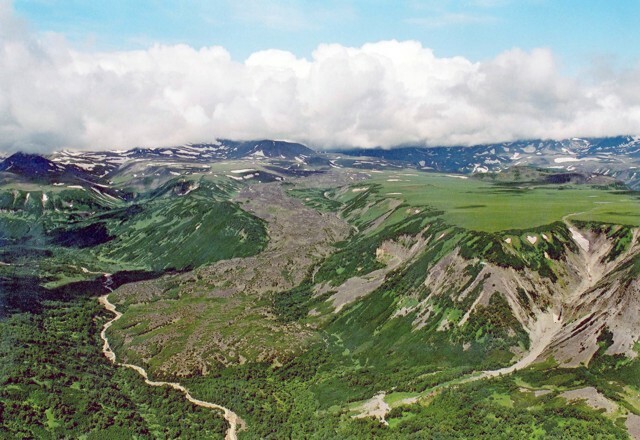 Long-lived volcanic centers of Kamchatka: types of cones, growth time spans, volumes of erupted material, productivities, rock proportions, and tectonic settings. Volc Seism, 17: 621-636 (English translation). Pevzner M M, 2004. New data on Holocene monogenetic volcanism of the northern Kamchatka: ages and space distribution. IV Internatl Biennial Workshop on Subduction Processes, Petropavlovsk-Kamchatsky, August 21-27, 2004, Abs. There is no Deformation History data available for Alney-Chashakondzha. There is no Emissions History data available for Alney-Chashakondzha. 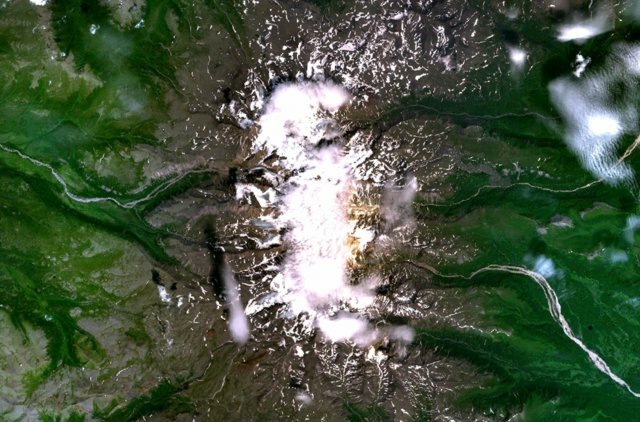 The glacier-capped Alney-Chashakondzha complex, its summit partially obscured by clouds in this NASA Landsat image (with north to the top), is one of the largest volcanoes of the Sredinny Range. It consists of two large Pleistocene andesitic stratovolcanoes, 2598-m-high Alney on the north and 2526-m-high Chashakondzha on the south, both capped with andesitic lava domes. The Kireunsky lava flow from a vent on the eastern side of the complex was erupted about 2600 years ago. 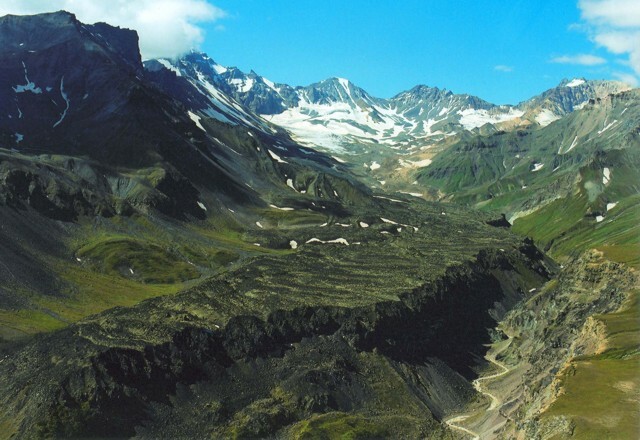 Glacial canyons descend from the western side of Alney volcano, which along with Chashakondzha volcano, forms one of the largest volcanic complexes of the Sredinny Range. Alney is one of the few large stratovolcanoes in the Sredinny Range known to have been active throughout the Holocene, with more than 30 documented pyroclastic deposits. Cinder cones on the east flanks of Alney and Chashakondzha volcanoes also erupted during the Holocene. Copyrighted photo by Adam Kirilenko, 2003. The Kireunsky lava flow was erupted from a vent on the eastern side of the Alney-Chashakondzha volcanic massif (background) about 2600 years ago. The lava flow was erupted from a vent east of Alney volcano on the divide between the Kirevna (far right) and Pravaya Kirevna (left foreground) rivers. Tephra from the Kireunsky eruption almost immediately overlies a tephra from a cinder cone to the south. Copyrighted photo by Adam Kirilenko, 2002. The Levaya Belaya lava flow was erupted from a cone 5 km ENE of the summit of Chashakondzha volcano. Flow levees are visible in the middle of the photo, and the Levaya Belaya River has cut a channel along the northern margin of the flow. The Levaya Belaya flow was radiocarbon dated at about 2610 years ago, and tephra from this eruption almost immediately underlies a tephra from another nearby cone 5.5 km east of the summit of Alney volcano. There are no samples for Alney-Chashakondzha in the Smithsonian's NMNH Department of Mineral Sciences Rock and Ore collection. IRIS seismic stations/networks Incorporated Research Institutions for Seismology (IRIS) Data Services map showing the location of seismic stations from all available networks (permanent or temporary) within a radius of 0.18° (about 20 km at mid-latitudes) from the given location of Alney-Chashakondzha. Users can customize a variety of filters and options in the left panel. Note that if there are no stations are known the map will default to show the entire world with a "No data matched request" error notice. Large Eruptions of Alney-Chashakondzha Information about large Quaternary eruptions (VEI >= 4) is cataloged in the Large Magnitude Explosive Volcanic Eruptions (LaMEVE) database of the Volcano Global Risk Identification and Analysis Project (VOGRIPA).